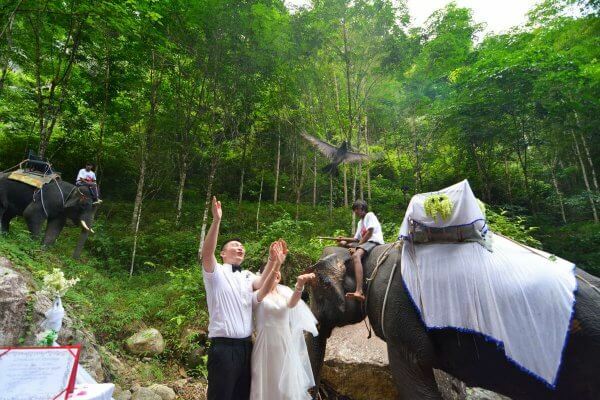 Our Elephant Wedding Package is one of our most highly recommenced and memorable ceremonies ” THIS IS ONLY ONE IN THE WORLD ” held deep inside one of Thailand most beautiful tropical rainforest, well known for its fauna and flora, wild life as well as the largest flower in the, world.the rafflesia. Your wedding day will begin with members of our staff and our hair beauticians will come to your hotel.for preparing the hair dressing and make up the bride and groom. After finished the make up, we then will take you by chauffeur driven car to the location in Phang Nga’s Tone Pariwat Wildlife National Park Sanctuary. We will then first stop at the monkey temple for feeding the monkey’s and visit the lime stone cave for a photo shot.then on to the mountain to the elephant camp where you will ride the elephant up to the wedding location through the forest on the back of the beautifully decorated elephants, seeing many species of wildlife, butterflies, monkeys, birds and other animals on the way. Short Description: Our Elephant Wedding Package is one of our most highly recommenced and memorable ceremonies " THIS IS ONLY ONE IN THE WORLD " held deep inside one of Thailand most beautiful tropical rainforest, well known for its fauna and flora, wild life as well as the largest flower in the, world.the rafflesia.